Pope Francis during the visit to the body of Miriam Wuolou, a receptionist at Santa Marta residence. Pope Francis's secretary, 34-year-old Miriam Wuolou of Eritrea, was found dead earlier this week — and the Vatican is calling foul. Wuolou's body was discovered in her Rome apartment by police after her brother raised concern that she wasn't answering her phone. She was seven months pregnant and suffered from diabetes, which can prove dangerous — even fatal — during pregnancy. 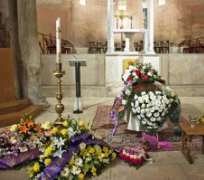 The Vatican, however, has called for an investigation into the woman's death. Police have interviewed her brother, her ex-husband and her most recent boyfriend, who is believed to be a policeman employed by the Vatican, the Italian newspaper Il Messaggero reports. Investigators will also perform a DNA test on Wuolou's fetus to determine the paternity of the unborn child. Wuolou's apartment has been sealed off; forensic teams have combed it for evidence and have even removed several personal effects for further examination, neighbors told The Daily Beast.